THE GILL FAMILY AQUATIC CENTER 2019 Season starts May 25th through August 6th. 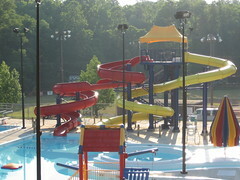 The Gill Family Aquatic Center is a great place to bring the family and spend the day! A renovation in 2005 supported by the community produced a modern aquatic center right in Danville’s own backyard. Its features include zero depth entry, play feature, lazy river, hydrotherapy, vortex, 2 over 120ft waterslides, diving board, and a splash pad. *Memberships,Rentals & Swim Lessons available online starting April 1st! See tabs above! Daycare Facilities: Please Print, Complete and Submit the forms in the note section below, prior to visit. Address Line One 450 Leedy St.